We license a hardware and software solution that can be used to input text with just one finger on even the smallest devices. By implementing Nydeum Technology you can keep all the pros and get rid of the cons of the regular smart TV remote. With Nydeum the typing is faster, easier and without taking your eyes off the screen. Future applications which we are already working on. One of the biggest challenge of wearables is inputting data on extremely small surfaces. We successfully solved this with our patented technology. Nydeum has solved that by unleashing exciting new ways to control and add text in VR/AR applications. A hands-free solution for efficient input while on the road. Intergrating Nydeum technology into new steering-wheels can provide manufacturers with an innovative way to control the computer systems in new cars. We have created a number of product prototypes to demonstrate the benefits and range of our input technology. In addition to the mechanical inventions, we have developed corresponding software to interpret the users' movements and translate them into language. The simplest Nydeum device. Compact, lightweight input and control device. Primarily developed for smart TVs. Simple character input in the most convenient way. Nydeum SmartAir is a special remote control designed to maximize your user experience and comfort. The device is not only compatible with Android TVs, but set-top boxes and even PCs for the most hands-on and comfortable experience. The World's First Standalone Smartwatch. We developed a smartwatch prototype that gives a real answer to the input challenges. All around the world, we see experiments trying to find a more efficient solution to this problem. With Nydeum you get a fully functional, wearable that is a replacement for current mobile phones. Our vision is to make wearables the number one cell phone replacement by adding a new level of interactivity. 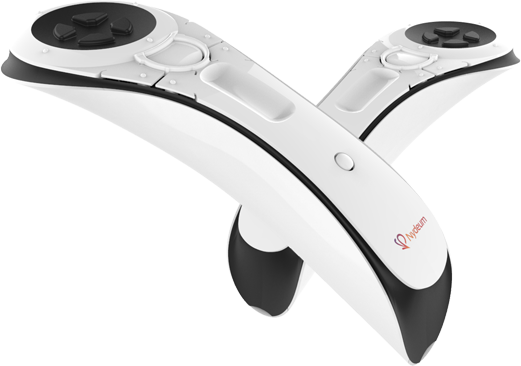 An input device using Nydeum technology. We can input text using extremely small gestures.It was designed to allow quick changes between character types (letters, numbers, glyphs). Gesture support is included for control and input. It can be manufactured in different sizes, and can support VR/AR, smart TVs, computers or smart home devices. We unified Nydeum technology with current cell phone benefits and created an entirely different and novel way for mobile phone control. Nydeum opens a new dimension in human-machine interaction by keeping the benefits of touch screens. The Nydeum input technology is the solution developed by our research lab. Our techology rests on two pillars. A control and input device, suitable for miniaturization, called the Nydeum Unit. A versatile software solution, called Nydeum Assist. surface capable of detecting small movements (patented). input and control is that transcends the current QWERTY solutions. developed to make the input of characters intuitive and natural. If you want to license our technology or want to cooperate with our R&D department, get in touch with us! Kossuth Lajos u. 12. Fszt. 1.